Tuesday the 19th of October was Lilly’s 2nd birthday. So on the 17th we went to the aquarium and Mt. Takasaki she really enjoyed it now she keeps asking to go there again, oh no!. 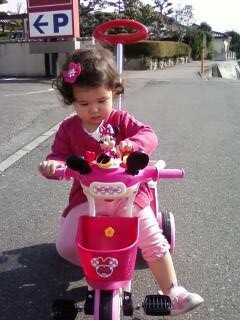 On the Monday we picked up her birthday present a pink Mini Mouse tricycle. She just loves it but hasn’t mastered the pedaling part yet, she’ll get there though! Let’s just hope it doesn’t rain all the time. Last week , a student brought in some real Jasmine so that we could enjoy some during the lesson. They were actual Jasmine buds and when in the hot water they open up, they look so unusual. I am not really much of a herbal tea drinker but I enjoyed it ! It tasted pretty good and guess it’s good for you too! Every now and again at my place we like to make takoyaki. We don’t actually use octopus , though. We usually put in bacon and cheese or tuna and cheese. You would be surprised how delicious it is, so light and fluffy! but the important thing to assure delicious takoyaki is the ingredients. When we make it we use okonomiyaki powder with yamaimo in it and you need to put in lots of cabbage and an extra egg is always good. Give it a try sometime and remember it goes well with beer too! I was really looking forward to the a chance to go cycling over Obon but, unfortunately just before Obon one of the spokes on my rear wheel snapped and the wheel bent. Luckily, I was only a few kilometers away from home but, I had to carry it home. I took the rims in to the shop but they were unrepairable so, I had to get some new rims. They arrived on the Thursday after Obon so, last Monday I got to go for a spin. The bike felt totally different. I’m looking forward to my next big ride. Welcome to the House Of English Blog. You will be able to find out the latest information about the school, news,events and maybe even study tips. Also you will be able to read posts written by the teachers about various topics. Anyway, today I started work in the afternoon so I had a bit of time with the family. 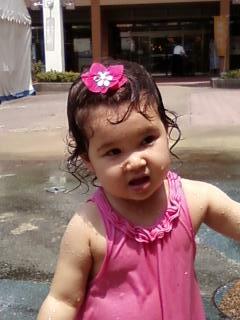 We went to Akeno Across and Lilly played in the fountain while mum went window shopping. She had a great time but didn’t want to go home ! I would have loved to join her, but probably would have looked a little strange running through the fountain. It would have been such a nice way to cool down. Everybody have a nice Obon. Welcome to the House of English Website! We are an English Conversation School based in Mori machi, Oita City, Japan.